Every story of friends has an annoyance. The question is how do you get around the annoying tendencies of your pals. Monkey and Elephant are good pals. They do everything together. Monkey likes shiny rocks. So does Elephant. Monkey likes to sing. So does Elephant. Monkey is tired of Elephant copying, even to the point of sneezing after she sneezes. 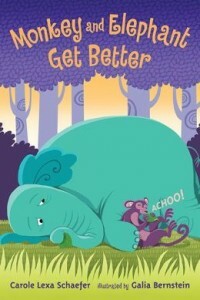 But Elephant isn’t copying, at least not with the sneezes. Elephant is sick. Now Monkey forgets about the concerns of copying in order to take care of her friend. Monkey thinks she knows exactly what will make Elephant feel better, but Elephant is different than Monkey and needs different things. When Elephant gets better Monkey gets sick and the roles reverse. The sweet, if not unexpected ending, is that both friends celebrate their own strengths and appreciate the strengths of the other. Monkey and Elephant Get Better is an early chapter book, written for the emerging reader and answers questions every young elementary school student faces: What is copying, or how do we make ourselves unique? How can we feel better when we’re sick? And how can we show we care about our friends when they are sick? While later books will get into more details about these questions, Schaefer does an excellent job of paring down to the core issues that puzzle these young learners. Second grade readers will enjoy reading this on their own. While it is longer than most picture books, it is illustrated with bright and informative paintings that will help with the reading comprehension of those trying to match the image to the word.